Forklift collisions are common, costly and dangerous. The damage can be severe. Simple, easily-installed guardrail systems can help protect people and property. Our new Guard Rail Guide offers you insights on the various options that we offer, as well as handy comparisons of rigid and flexible systems. This PDF document helps guide you on how guard rail impact ratings are calculated and used, styles of railing and their applications, and more. 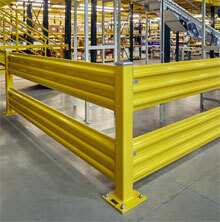 ALSO KNOWN AS: Interior protective railing, warehouse railing, rack end rails, metal guard rail, forklift railing.